In recent years the Land of Lincoln has been host to some of the nation’s most important battles for the Second Amendment, including McDonald v. City of Chicago, Shepard v. Madigan,and Moore v. Madigan. This trend continued with two new Illinois cases, one challenging the state’s concealed carry licensing practices in federal court (Illinois State Rifle Association v. Grau), the other challenging them in state court (Illinois Carry v. Illinois Department of State Police). In April, NRA’s Illinois state affiliate, the Illinois State Rifle Association (ISRA), and license applicant Steven Thomas filed a complaint for declaratory and injunctive relief against the Director of the Illinois State Police and members of the state’s Concealed Carry Licensing Review Board in the U.S. District Court for the Northern District of Illinois. 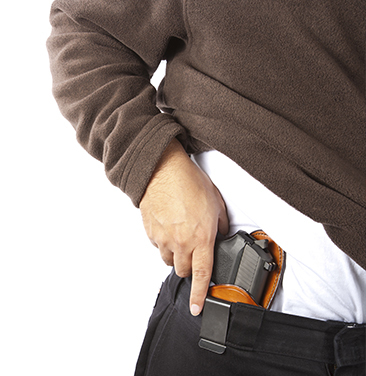 In 2013, after court decisions invalidated Illinois’ complete ban on carry outside the home, the General Assembly enacted what is essentially a shall-issue concealed carry licensing law. The law, however, allows law enforcement officials to file objections to applications under some circumstances. The suit took issue with the state’s practice of denying license applications under the objection provisions, claiming that the denials lack the due process required by the U.S. Constitution. Thomas’ application for a carry license was denied via letter, with the complaint noting that “[t]o date, Mr. Thomas has not been informed of the basis for the objection.” The complaint went on to explain that Thomas was never provided an opportunity to address the Board’s concerns about his license application and that he was denied due to the “objections to the [Concealed Carry Licensing Review Board] from an unnamed law enforcement agency.” Several ISRA members have had denial experiences similar to Thomas’s. Under Illinois’ law, those denied licenses by the Review Board are entitled to a judicial review of their denial. However, no new testimony or evidence can be examined in such a proceeding. Moreover, in the cases cited in the complaint, the Review Board has withheld the reasons for which the applicants were denied, so the applicants could not adequately address the alleged concerns in their response to the denials. Thus, persons denied by the Review Board have never been allowed a meaningful opportunity to offer evidence on their behalves. The complaint asked the court to deem Illinois’ current concealed carry license review procedures a violation of the U.S. Constitution’s Due Process Clause and to reconsider the applications of those mentioned in the suit who have been harmed by the current policies. After the case was filed, the Illinois State Police (ISP) essentially conceded that the procedures under which the plaintiffs were denied did not comport with due process and published a set of emergency rules that purported to address the issues of notice and opportunity to be heard. While the rules did not resolve all objections to the licensing procedures, lead plaintiff Thomas was able to obtain additional information about his denial and to provide a response, and his application was subsequently approved. Based on this favorable outcome, the plaintiffs agreed to dismissal of the federal case. The state-level case raises similar issues before the Circuit Court for the Seventh Judicial Circuit of Illinois. The complaint was brought on behalf of several Illinoisans who were denied licenses, along with the gun rights organization Illinois Carry, against the Illinois Department of State Police and members of the Concealed Carry Licensing Review Board. As with the federal suit, the state case cites inadequate opportunities for applicants to be heard and to contest their denials. The state plaintiffs, however, resort to the due process protections afforded under the Illinois Constitution. The complaint asks that the court find Illinois’ current procedure unlawful and that the plaintiffs’ applications be reconsidered “in a manner that comports with the Due Process Clause of the Illinois Constitution.” Because of distinctions in the circumstances of the cases and the protections afforded under the due process clauses of the constitutions of Illinois and the United States, the state case has gone forward, despite issuance of the ISP’s new emergency rules. While cases involving semi-auto bans and right to carry restrictions garner much of the gun litigation headlines, cases involving constitutional due process are also of great importance. Due process ensures government officials cannot arbitrarily deny a person life, liberty, or property based on unsupported accusations or arbitrary decisions.